The egg veil moves very slowly with the currents in the tank. The goose fish is in the lower left corner of the tank, to the left of the orange sea star. Egg veils are usually about a foot wide and can reach 60 feet long, containing about a million eggs. 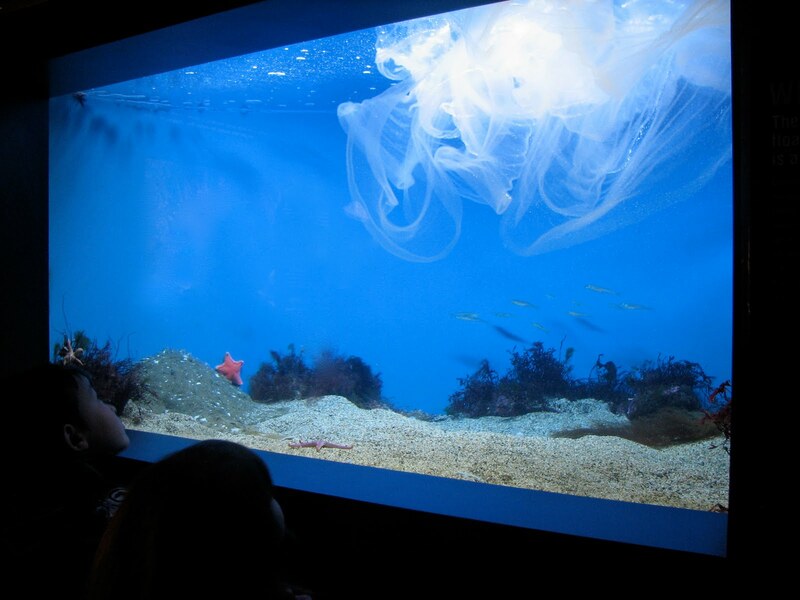 "It feels almost like a sea jelly," says Bill Murphy, aquarist in the Northern Waters Gallery. "The veil is pretty strong." Seen from above, you can almost make out the tiny eggs that comprise the sheet. Murphy could tell that the goosefish was getting ready to lay the eggs because she was so much larger than usual. Murphy says this particular fish has laid an egg veil around the same time of year for the past couple years. Another neat fact about goosefish: They have a modified dorsal fin that they dangle to attract prey, almost like their own fishing lure. Come visit this fascinating fish at the New England Aquarium! The egg veil will remain in the exhibit for the next couple days. While you're here, don't miss the giant Pacific octopus just a couple tanks down from the goosefish in the Northern Waters Gallery. Murphy posted about the unusual and amazing talents of these intelligent animals in a guest post on the Aquarium's Divers Blog. Click through to see pictures of the octopus squeezing into a clear box! As a certified dry suit diver, Murphy also recently taught teens in the Aquarium's SEA TURTLE program that not all scuba diving is warm water diving!